This past Saturday was that most Swedish of holidays, Midsummer. It's a day when everyone abandons the cities for their familial stuga in the woods, to bask in the nigh on 24 hours of glorious midsummer sunshine while eating plates full of herring and potatoes, pausing only to sing traditional drinking songs and down yet another glass of aquavit. What, exactly, you are supposed to do on a rainy and cold midsummer day when you happen to be a foreigner who owns no cabin in the woods, has not been so clearly explained. This is not an issue which appears to occur to Swedes. For example, the organizers of the conference Jennifer attended last week in Uppsala encouraged foreigners to attend by mentioning how wonderful Sweden was at midsummer; they neglected to mention that, as the conference ended the afternoon of midsommarafton, there would be absolutely nothing to do in Sweden in its aftermath. Friday night there was only one restaurant open in Uppsala (which somewhat grudgingly took those attendees who were not flying out until the next morning)—a bar or a nightclub is simply out of the question. Tourist attractions shut down for the weekend as well. We spent midsummer with our Swiss friends G. and D. again,although it wound up being a much larger gathering. We started the day around noon with six of us, the other two being C., a new Danish post-doc (with an Irish accent) in Jennifer's lab, and M., a Québécois house guest of G. and D.'s. Despite the grim forecast for the day, it was sunny and relatively warm on our arrival, so we decided to start the day with a round of lawn games. 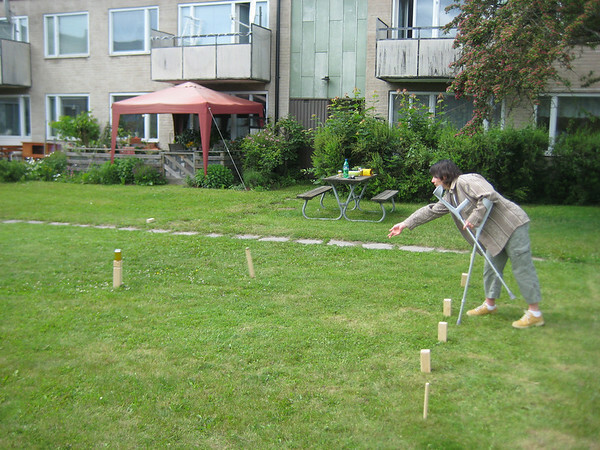 The local lawn game of choice (forgive me if we've described this in some detail before) is Kubbspel. This is, in fact, the game I referred to last summer as, "a bunch of people standing in two lines, taking turns throwing sticks at each other," or words to that effect. It is a game native to the Gotland region, but the implied antiquity of that statement is hard to support: in fact, despite its occasional billing as a Viking lawn game, Kubbspel appears to have arisen in Gotland in the 1990s when someone invented the game and began selling it. This does not detract from its entertainment value, however. There are already some perfectly decent explanations of the game online, so I shan't attempt to replicate them. In brief, though, you divide into two teams, each standing behind a line of 5 wooden blocks. The teams take turns throwing a set of slightly smaller sticks at their opponents blocks. Knocked over blocks are claimed temporarily by the team that knocked them over, adding to their own collection until they are knocked down a second time. Once all the blocks have been eliminated, a larger block in the center, the "king," is knocked down as well, and the game ends. "A minute to learn, a lifetime to master," may be overselling it a little (OK, a lot), but it does involve more strategy than I'm implying it does, and we happily wiled away a number of hours throwing sticks and drinking beer. Eventually though, the sun went away, and the cold dark clouds rolled in. 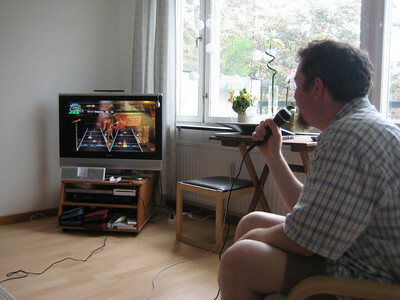 So we headed inside, and channeled our competitive natures in to a bit of spirited Guitar Hero. Sometime in between my massacre of "On the Road Again," and Jennifer's rousing rendition of "Crazy Train" the remaining guests arrived: Jennifer's co-worker K., her boyfriend visiting from Poland, and their Polish friend along with her Swedish boyfriend (who was in town because he had to, gasp, work on midsummer—but no worries, his family called from the stuga to rub in how beautiful the weather was there). Dinner was, of course, excellent: a whole poached salmon, färsk potatis och sill, a couple of shrimp salads, buttermilk cole slaw (hmm, if only I could tell what the Americans made…), home made bread, and a few other dishes which elude me at the moment. 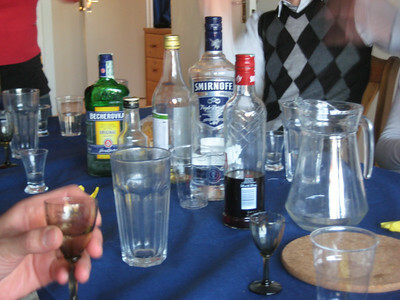 There was also, of course, a selection of appertifs, including aquavit, a spicy cherry vodka from Poland, Becherovka, and a Portuguese almond liqueur. This is where having a Swede in the mix started to show, as we were in fact led in a series of traditional songs between courses. By the time we had rounded off the entertainment with a couple of highly entertaining table games (like a local variant of Fuzzy Duck, which involves lots of hand waving and never showing your teeth), it was fast approaching 11 in the evening, and with the realization that the busses and trains would stop running soon there was a rather abrupt mass exodus as we all headed off towards our respective homes. Fortunately the clouds had cleared by then, so we had a bright and sunny bus ride back to Eriksberg. "Jennifer's rousing rendition of "Crazy Train""
Wish I'd been there. Can she do that laugh at the beginning???? ?